Aug 31 Want to attend How Magazine's Mind Your Own Business Conference? I've got a code for you! If you are a credit union marketer, this post is likely not for you. But if you are a marketing agency or design firm owner, then this post is definitely for you! After being in business for ten years, I attended How Magazine's inaugral Mind Your Own Business conference in Cancun, Mexico in 2000. It was a watershed moment in my professional life. Up until that point, my business had grown like wildfire, but it felt like a handful of mud. If you've every tried to keep a handful of mud from slipping through your fingers you know what I mean! In design school I was taught how to design, not how to run a business and my first decade in business was an adventure in figuring things out in complete isolation. I learned so much at that those three days in Mexico. It was amazing. I have attended three more MYOB Conferences since and each one has been incredible. It's not cheap, but worth every penny. Fast forward ten years later and I've been asked to speak at this year's MYOB Conference in New York. I am totally honored and excited by the opportunity. As a speaker, I’d like to invite you to join me at this year’s event being held October 12 to 14 at the Sheraton New York Hotel & Towers. Tailored specifically to address the challenges faced by creative-firm principals and owners, this one-of-a-kind business conference offers ways to improve your corporate positioning, grow your bottom line and realize your firm’s potential. Trust me, you'll learn a ton and meet other people in your situation. 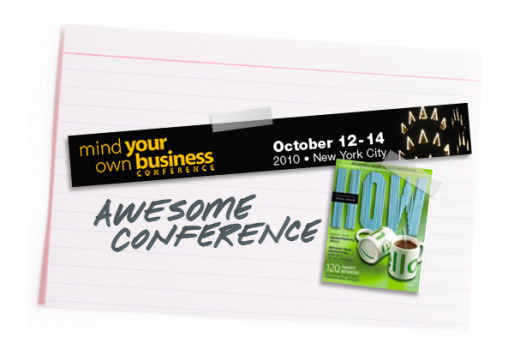 For complete session descriptions, speaker info and everything else you need to know, visit www.MYOBconference.com. And be sure to use discount code MTM10 to get an additional $100 off the registration rate. See you in New York! Sep 1 What's Your CU BHAG?